What did you think an artist would pick up on from your story? Writer Paula Carter: I wasn’t sure. As the creator of something, you are often too close to it to understand what others see. As the reader, you react to something as it is, whole. As the writer, a piece always has a longer more complicated story to tell. Artist Anya Ermak-Bower: The depth of time. And the simple pleasures of a human life. Did the visual artist refract any element of the poem that made you see the story differently? 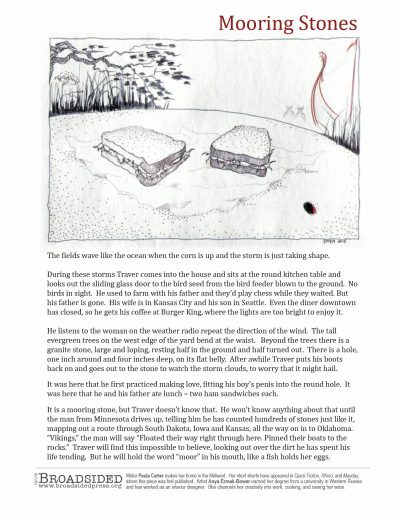 Writer Paula Carter: The image’s focus on the two sandwiches made me think more about how the piece deals with connecting to others. Out of everything in the story, the ham sandwiches seem so regular and human. They even look a little human-like, sitting there on the stone. Artist Anya Ermak-Bower: The “aftertaste” of the story, which felt it have a good potential to become materialized. Writer Paula Carter: Anya lives in Japan and went to school in Russia, so it was interesting for me to see how she visualized the Midwestern landscape. I appreciate that it avoids common tropes (windmills and barns). And that the place seems to almost be otherworldly, kinda like what it might be like to blend a Viking sense of place with a Midwestern one. If you had to represent the Broadsided of “Mooring Stones” with one word, what would it be? Writer Paula Carter: Olive Kitteridge by Elizabeth Strout. It deserved the Pulitzer. Writer Paula Carter: I just saw the Alexander Calder exhibit at Chicago’s Contemporary Museum of Art. It was awesome. His work is so beautifully crafted, so fun and, dare I say, uplifting. Artist Anya Ermak-Bower: The tale of Maggi has great illustrations i was trying to absorb. Writer Paula Carter: Thanks so much to Anya. Such a gift to have someone reflect your own work back to you. Artist Anya Ermak-Bower: I just love Broadsided. It’s like a spoonful of chocolate ganache at a … church potluck? Haven’t been to one, but heard a bit about food there. Is it true? Writer Paula Carter makes her home in the Midwest, from which she garners much inspiration. Her short shorts have appeared in Quick Fiction, Rhino, and Mayday, where “Mooring Stones” first appeared. She received her MFA in creative writing from Indiana University and is currently working as a freelance writer. Artist Anya Ermak-Bower earned her design degree from a university in Western Russia. After living in Alaska for five years and working as an interior designer, she moved to Japan with her family. She channels her creativity into work, cooking, and raising her sons.